Canadian mystery and suspense writers are becoming better known south of the border as our northern neighbors publish more and more captivating and compelling works that rival the best the rest of the English-speaking world produces. This Canadian writer’s Vancouver noir novels feature a rather reckless PI who doesn’t hold back just because a risk is involved. Nominally a partner in Wakeland & Chen Investigations, a firm that is becoming more upscale each quarter, David Wakeland is more interested in finding missing persons than in the firm’s security work. The fact that tracking down missing persons or involving himself in other criminal investigations is not at all profitable doesn’t keep David from taking on new clients even though his partner, Jefferson Chen, disapproves. There’s no profit in missing persons, and besides, it’s frequently dangerous. In Chen opinion, David’s luck will run out one day, and he will die in some violent and unpleasant way. David ignores his partner’s worries, and aided by his younger sister, Kay, who finds detective work very exciting, takes Dana Essex as a client. Dana wants David to find Tabitha Sorenson, a young college student who has disappeared in the midst of a scandal involving millions of dollars in missing college funds. Dana Essex, “. . . looked as if she’d been dressed by a Canadian TV show. A background player, College Professor Number Three.” The bland-looking professor assures David that Tabitha had nothing to do with stealing the money from the college fund, while she tries to hide her personal, perhaps romantic, interest in the young girl. David doesn’t care about what Essex may feel for Tabitha; he’s interested in finding her. His interview with the accounting firm that audited the collage fund convinces him that Tabitha is up to her eyebrows in the missing funds which amounted to more than he realized. “The ruling party controlled the election budget, the health and dental fund, a number of scholarships, and the events account.” The students on the council that control the funds are literally in charge of millions of dollars every semester, with very little oversight by the college. David and Kay discover Tabitha hiding out with her boyfriend, a rather meek librarian only interested in protecting her. After staking out the house, David concludes that Tabitha is not attracted to Dana Essex, and tells the professor so. He learns too late that sharing the information about Tabitha’s whereabouts with Dana Essex might not have been his best idea. The next day Tabitha is dead, her librarian boyfriend tortured, and the milquetoast Professor Dana Essex is gone. Did Dana murder Tabitha or was it the college student’s criminal friends? Cody Hayes, better known as Baby Godzilla, “. . . wouldn’t look out of place amid the city-devouring monsters of Toho Studios,” and his brother, Dalton, the brains of the two, deny any knowledge of Tabitha. They hadn’t seen her for years. Another complication that doesn’t make David’s life any easier is his old partner (and former lover) when he was a cop, who wants him to follow her new partner. Chris Chambers. Sonia Drego suspects Chris, the Golden Boy whom everyone likes even if he did screw up so badly as a rookie that he will be promoted beyond constable, of being corrupt. Trailing Chris to a meeting with a Chinese gangster, David agrees with Sonia: Chris Chambers is so corrupt, you can smell his stink a mile away. David witnesses Chambers nearly beating a man to death in an ally. Not only is Chris Chambers corrupt, he is violent. Then suddenly Sonia tells David to forget investigating Chris. What is going on with his former partner? Does she want Chris Chambers and his corruption uncovered or not? Trying to find Dana Essex, trying to discover just who she is, because she is not a mild-mannered professor, and trying to avoid the Hayes brothers, are enough to keep David awake at night. He doesn’t need Sonia suddenly changing her mind. An altercation with the Hayes brothers that nearly sends him to a heavenly address, and a deadly meeting with Dana Essex threaten to fulfill Jeff Chen’s prediction that David Wakeland will wake up dead one morning if he doesn’t stop taking chances. 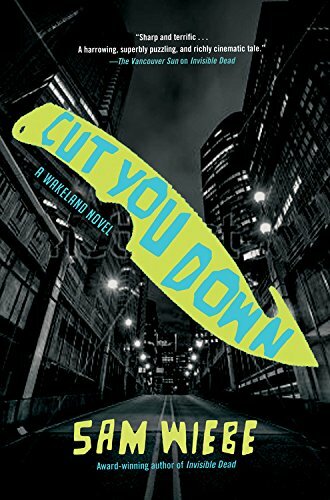 An exciting, page-turner that all fans of noir will enjoy, Cut You Down by Sam Wiebe introduces Vancouver to a U.S. audience that might not be all that familiar with the city. A wonderful setting and likeable characters, lots of action and subtle humor will have readers calling for more stories featuring David Wakeland.